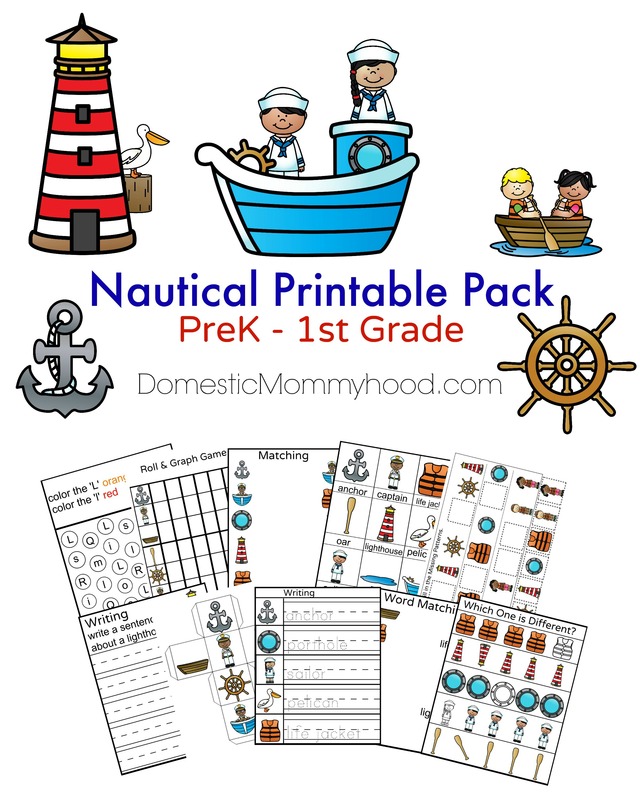 Summer is here and what better way to celebrate than with this awesome Nautical Printable Pack for PreK on up to 1st grade! It could be used for a few different lesson plans including nautical, summer or even different states such as Maine. Your child can practice their writing skills, letter recognition, small motor skills, cognitive thinking and much more. I find it works well if you print off the sheets and use a laminating machine on each sheet. That way you can use a dry erase marker and the kids can use them over and over again. Card stock is great to use on the Roll & Graph Game. That way when you fold your roll-able dice up it is a little more stable and will last a little longer. Just click here to print off you very own Nautical Printable Pack! Make sure and stick around and check out our other Printable Pages here at Domestic Mommyhood! Here are some books that I recommend with a Nautical Theme…….